Another year, another round of American Board of Plastic Surgery MOC (Maintenance of Board Certification) chores. I have two American Board of Medical Specialties (ABMS) recognized board certifications. One is from the American Board of Plastic Surgery and the second is from the American Board of Surgery. Both represent years of training and hard work and now with the additional MOC requirements, the completion of yearly chores. Achieving Board Certification is an important milestone in a doctor’s training. It certifies that they graduated from a recognized residency training program and that they have passed a series of written and oral examinations, and if I had graduated two years sooner, that would have been the end of the story. I graduated and certified in the era of time-limited certification, so every year there are some requirements to fulfill. The MOC examinations are given at computer based testing centers throughout the nation. All sorts of examinations are given at these centers and most have nothing to do with medicine. The staff at these institutions have strict regulations to enforce. The rules are designed to stop cheating and protect the proprietary information that is contained on the examination. I recently visited one such institution to take my ten-year recertification examination for the American Board of Surgery, and am required to take the American Board of Plastic Surgery MOC examination by 2019. This question is becoming more and more controversial as the fees, exams and other hurdles are raised higher and higher each year. It took several days to complete the application and collect the required information, and it’s not cheap. Those in favor of MOC claim that board certification is a way to make sure that your doctor is still good. Those opposed cite the ever escalating cost and time away from the practice required as prohibitive. They are also correct in pointing out the lack of evidence that MOC actually makes us better doctors. Personally, I don’t mind. It is a hassle, and it does not change the way I practice. On the other hand, it shows my patients a clear commitment to being the best Plastic Surgeon I can be. I don’t mind being tested. Plus, when I pass, I will have another lovely certificate to show everyone. I completed a General Surgery residency in 1994. I passed my General Surgery Boards in 1995 and have recertified twice. I am good until 12/31/2025, as long as I complete my yearly chores and pay my yearly fees. I completed a Plastic Surgery residency in 1997. When I finished my training, it took two years to take the certification exams. I passed my Plastic Surgery Boards in 1999, and have recertified once, so I am good until 12/31/2019. Looking forward to the next exam. There are many boards out there, but the “real” boards are those under the umbrella of the American Board of Medical Specialties (ABMS). This is the longest standing body for Medical Certification in the US. 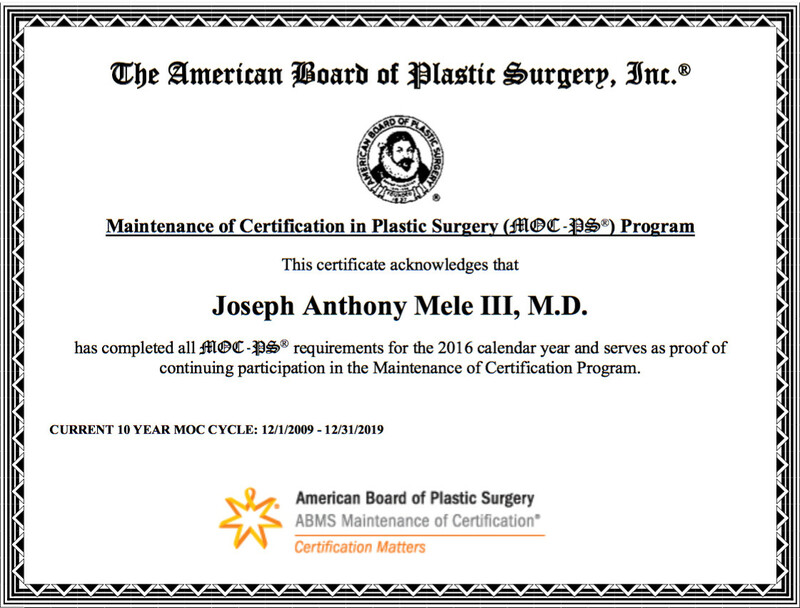 The American Board of Plastic Surgery was born from members of the American Board of Surgery and the American Board of Otolaryngology who did what is now recognized as Plastic Surgery, and remains the only ABMS Board certifying Plastic Surgeons. If you are considering Plastic Surgery, be certain to check your doctor’s training. Good training, and the maintenance of that training, are essential for providing the safest and most predictable results.